On Sunday October 18, 2015 I attended the 50 Plus Living Show in Winnipeg. 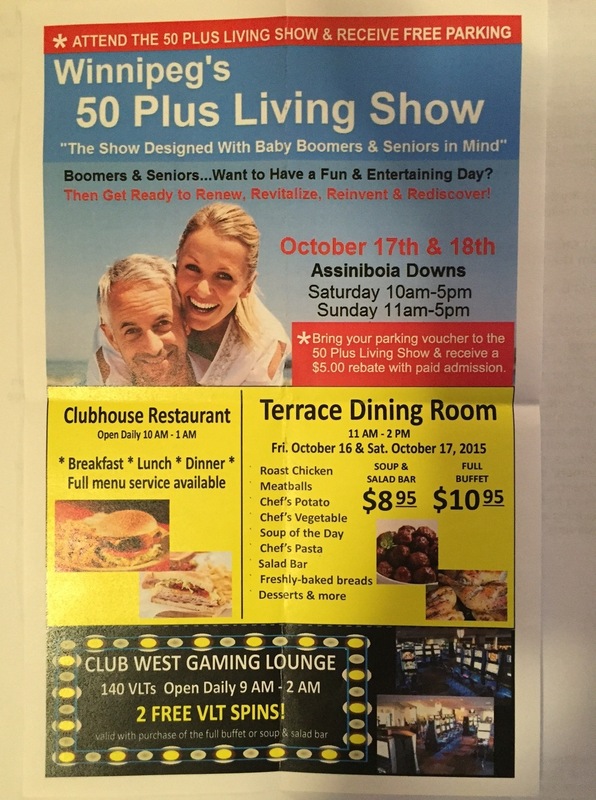 It is “The Show Designed with Baby Boomers and Seniors in Mind.” It was held at the Assiniboia Downs Saturday 10-5pm, and Sunday 11-5pm. Parking for the event was $5.00, but when I presented my parking voucher at the front door, they took it and and that was my entry into the event. I was there for over three hours! There were many tables on skin care (anti-aging), travel, financial/wealth management, and home health products. There were also a number of other different and interesting services and products such as realtors, health supplements, and jewelry. There were three rows with tables on each side, the length of the building. I estimate about 45 tables. There was also entertainment and speakers. I picked up many brochures and received many free treats such as chocolate candies and Werther’s. I even got a bottle of water and an apple and some hand sanitizer. Many tables were giving out nice pens, too. I had my back scanned by a chiropractor, and tried samples of skin care products. I even got a sitting shoulder and back massage! I entered many free draws, there was even a draw for an Apple Watch! There were a few other tables that I didn’t get to, such as Juenesse (http://www.agelessiq.com/) and Investor’s Group and some other skin care tables. There was also a group promoting a new housing community in Dugald. I am looking forward to enjoying my new connections and learning more about the above-noted services and products. I will definitely attend and network again next year!